"If we know how blood vessels move towards a tumor and know they take the form of a soliton, we can slow down their growth or prevent them from reaching and feeding the tumor by controlling the movement of this wave," said Luis L. Bonilla, director of the UC3M Gregorio Millán Barbany Institute. Bonilla carried out the research with the assistance of University colleagues Manuel Carretero and Filippo Terragni. In their study, recently jointly published in the journal Scientific Reports with a colleague from the University of California at Santa Barbara, the UC3M scientists made a mathematical description of the density of blood vessels associated with the growth of tumors through differential equations. Moreover, they confirmed this model through numerical simulations. "We saw that in the first stages, the density of the tips of the capillaries that move toward the tumor take the form of a soliton, similar to the waves of a tsunami or those that form in an irrigation canal when you stop the water with a brick and suddenly remove it," explained Professor Bonilla. This line of research began at UC3M in 2014, during the stay of Professor of Excellence Vincenzo Capasso, from the University of Milan. "It was then that we identified some problems about angiogenesis and we were able to deduce the equation for the density of the capillary tips, something that eluded researchers for years," said Professor Bonilla. 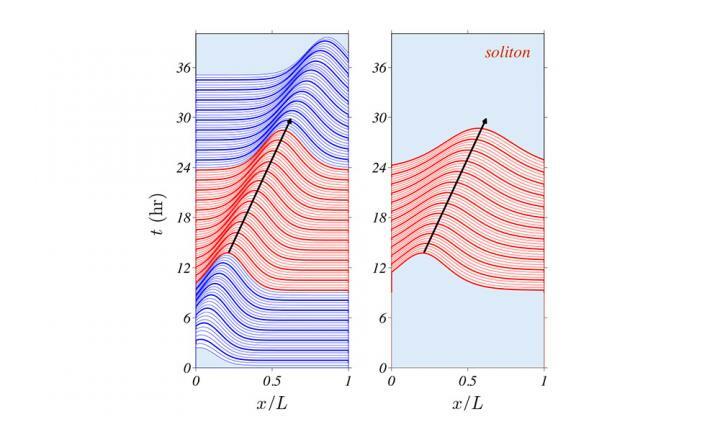 Afterwards, on the basis of the equation they developed with Professor Capasso, they published this study about the soliton jointly with Bjorn Birnir, from the University of California at Santa Barbara. "A soliton is a wave that can spread for a long time without changing much," explained Birnir. And what that means within the context of this study is that "the tips of the veins take on a shape that does not change, lasting from the time the soliton forms until it reaches the tumor," he said. Angiogenesis is the process of generation and growth of blood vessels. It is a natural mechanism that is activated when oxygen does not reach some cells in a tissue and they secrete growth factors. When these substances reach a blood vessel, its walls open and capillaries emerge and move toward the area where the growth factors are secreted, taking oxygen and nutrients there. Thanks to angiogenesis, tissue wounds heal and organs grow and regenerate. Cancerous tumors take advantage of this mechanism to secrete growth factors and attract capillaries that nourish them and enable them to grow. In addition to cancer, the imbalance of the process of angiogenesis occurs in numerous illnesses, such as cardiac ischemia, diabetic retinopathy, rheumatism, musculoskeletal disorders, etc. This knowledge is also applicable in other conditions where the growth of blood vessels is an important factor, as occurs in the eyes of premature babies. As a result, the researchers note, the understanding and control of angiogenesis are of enormous importance in current and future medicine. "Identifying the soliton as the motor of angiogenesis suggests the possibility of controlling this complex process through the analysis of the collective coordinates of the soliton, which are much simpler. This might be an important first step for the understanding and control of angiogenesis induced by tumors through theoretical models," said Bonilla.